Ryan Bednard had barely begun grade school when he was first invited to the pond. Growing up, Bednard was part of an extended hockey family in Macomb County, Michigan. His older brother Shane and their cousins, among others, gathered as often as possible at a frozen pond near their homes to engage in impromptu hockey games. The young Bednard was eager to participate in this practice of the sport in arguably its purest form, but the older ones had a designated place for him on the ice. When it came to an organized setting, Bedard actually began playing roller hockey first before joining his first ice hockey team at about age 7. He’s been guarding goals ever since. “Things ended up working out for me,” he said. Bednard, now a Bowling Green junior, is among the nation’s best netminders. He leads the WCHA and is fifth in the nation with a 1.85 goals-against average. Bednard’s saves percentage (.925) is second in the conference and 12th in the country while his winning percentage (.700, 13-5-2) is third in the WCHA and tied for 11th in the nation. Bednard, taken by the Florida Panthers in the 2015 NHL Entry Draft, is on pace to eclipse Bowling Green’s single-season gaa record of 1.91 set by Chris Nell in 2015-16. Only Quinnipiac’s Andrew Shortridge and Ohio State’s Tommy Nappier are also among the NCAA Division I top 12 in gaa, saves percentage and winning percentage. Bednard, one of 20 goalies on the watch list for the Mike Richter Award, is enjoying his finest season thus far with the Falcons. He has improved from a 2.25 gaa, .916 saves percentage and .630 winning percentage (15-8-4) last season. Typical of Bednard’s personality, he is quick to credit teammates for his improvement. The entire Bowling Green defense, including backup goaltender Eric Dop, have stepped up their play and more. In fact, the Falcons boast the nation’s No. 1 scoring defense, giving up just 1.83 goals a game, down from 2.44 a year ago. They are also fourth in penalty-kill percentage (.876), up from .824 last season. Bergeron is quick to point out that all the initiative Bednard takes to elevate his game must not be overlooked. No other starting DI goaltender is taller than Bednard, although Boston University's Jake Oettinger is also 6-foot-5. Bednard is unbeaten (5-0-1) against teams currently ranked in U.S. College Hockey's Top 20 poll, including a sweep of sixth-ranked WCHA leader Minnesota State in December during which he allowed just two goals in two games. The Mavericks entered the series averaging 4.4 goals per game. “I hope my best moment of the season is yet to come, but sweeping a team like Minnesota State was pretty special,” he said. As a result of that performance and others, Bednard was named WCHA Goaltender of the Month. He posted a 3-0-1 record, giving up just seven goals and making 93 saves. Bednard also earned the October award after going 5-0-1 with a 1.48 gaa and .940 saves percentage. He has been named WCHA Goaltender of the Week twice this season, as well. The healthy competition between Bednard and Dop has also played a role in his success. They form one of the country's best goaltending tandems. Dop, a sophomore, has gone 5-3-1 this season, including three shutouts, with a 2.07 gaa and .919 saves percentage. The pair actually platooned to start last season following the graduation of Nell, who holds Bowling Green's career records for gaa (2.07), saves percentage (.922) and shutouts (11). Bednard became the team’s No. 1 goalie in December, but Dop was still named to the WCHA All-Rookie team. Ryan and his older brother Shane Bednard are in their third and final season as Bowling Green teammates. Shane, a senior forward, committed to the Falcons in February 2014 followed by Ryan eight months later. Just eight months after committing to Bowling Green, the Panthers drafted Bednard in the seventh round. He was the sixth American goaltender taken. Bednard has already been to three development camps with the Panthers and will be attending a fourth this summer. Bowling Green is 18-8-3 overall and second in the WCHA with 43 points (13-7-2) heading into this weekend’s home series against Alaska Fairbanks. The Falcons, 16th in the latest U.S. College Hockey Poll, trail first-place Minnesota State by nine points with six regular-season games remaining. Bowling Green, which should win at least 21 games for the fifth straight season, is seeking its first NCAA Tournament berth since 1990. 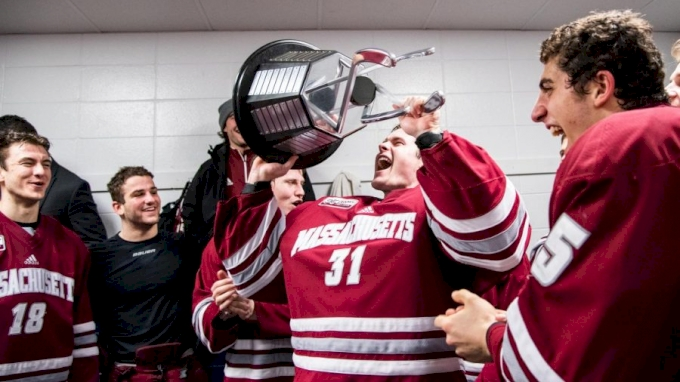 A field of 16 teams will make the tournament and the Falcons are 14th in the latest Pairwise rankings which mimics the criteria used by the NCAA Tournament selection committee. Regardless of how this season concludes, Bergeron is thankful Bednard will be anchoring the Falcons for one more year. His 2.15 career gaa and .916 saves percentage rank second in program history behind Nell, whom he backed up as a freshman. Bednard is already tied for fourth on Bowling Green's all-time list with six shutouts. His career record is 31-16-6. Mark Spezia is a freelance writer based in Lapeer, Michigan, whose work has been featured in the Detroit Free Press, Hour Detroit Magazine, ESPNW.com, and Flint, Michigan-based My City Magazine. He is a former sports writer for the Flint Journal and Daily Mining Gazette in Houghton, Michigan. He also served as sports editor of the Lapeer (Michigan) County Press.